If the sun damage on your face has left fine lines, wrinkles, or extensive age or pigment spots, you may want to consider fractional skin resurfacing with our Lux 1540 Fractional laser in order to maximize your facial rejuvenation. Ultherapy® is also a great way to rejuvenate the face. This technology uses ultrasound to non-invasively lift the eyebrow, the neck, and under the chin. Perhaps you had moderate to severe acne in the past or as a teen and are left with significant acne scarring. 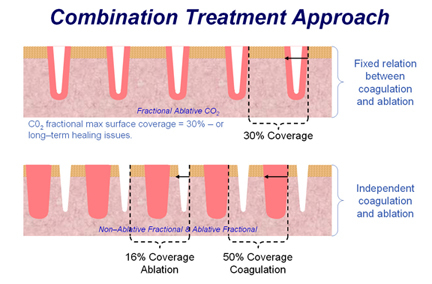 If so, you may derive significant benefit from fractional skin resurfacing with our Lux 1540 Fractional laser. Lasers and pulsed light treatments can be used to lighten the color and dull the appearance of various types of scars. Surgical scars become less distinct. 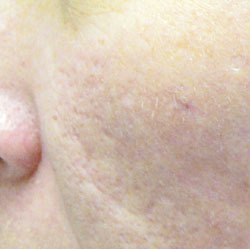 Acne scars appear more subtle. Lasers and pulsed light treatments can be used to lighten the color of scars and darkly pigmented lesions. With newer fractional technology we are now able to treat even the darkest skinned clients safely. We also have various cosmeceutical products that can be used in concert with our laser and light-based treatments to treat the problematic areas of hyperpigmentation. 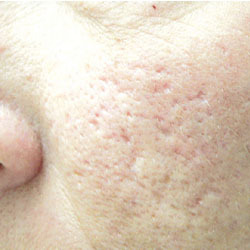 Melasma and pigmented lesions appear to lighten. Stretch marks become less noticeable. Since this is a non-ablative laser and leaves the skin intact, there is minimal, if any, downtime. The procedure is quite comfortable and usually only requires application of an anesthetic cream to maximize the comfort. For more details on facial rejuvenation in New Rochelle, New York, and to schedule an appointment with our cosmetic surgeon, Dr. Julie E. E. Kupersmith MD, contact our office today.